i know that these have been making the rounds, but really everyone needs to see them. 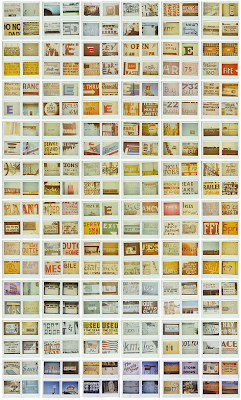 the vernacular typography polaroids are created by mr doug wilson who is the designer/letterpress lover/ university professor/photographer type ... in other words quite interesting ... and can be found here. these photos have been taken over the past four years and are mostly of hand painted signs found all over the united states. i love the slightly washed out colors, and seeing them as a group kinda makes me want to cover a wall in polaroids.